It’s early morning and you’re brewing a good cup of your favorite coffee. Or it’s about 3 o’clock in the afternoon and it’s definitely time for a pick-me-up. 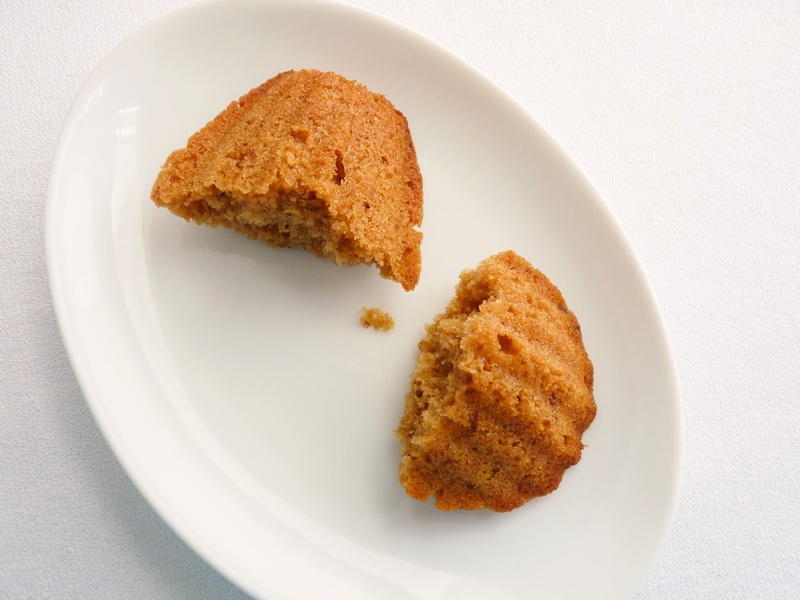 Madeleines are a really quick and easy snack cake that are perfect for those occasions when you’re looking for just a little something to go with your morning or afternoon hot beverage break. Originating in northeastern France as a plain little sponge cake, all sorts of flavors are now in vogue, making it much more fun to experiment with madeleine batter. I don’t know the history of why it’s baked in this particular shell shape that is its unique identifying factor. 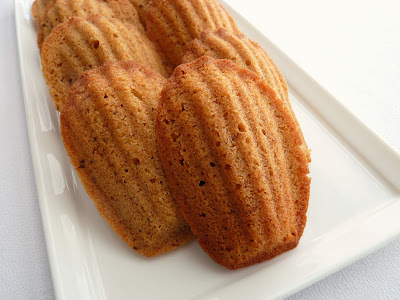 Having just bought a fresh new jar of espresso powder, I decided to make my madeleines all about this robust coffee flavor. And I'm very glad I did. These quickly became one of my favorite madeleine permutations. The brown sugar and a light pinch of cinnamon really round out the flavor. 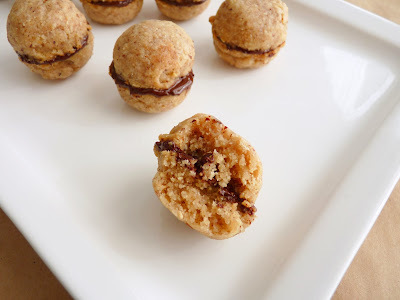 They’re light and delicious and give you a nice little jolt of coffee flavor, perfect for the adult madeleine lovers in your circle. Note that these little cakes are baked at a higher temperature so it can be very easy to over bake them. Instead of light soft and moist cakes, you get tough and dry rubbery slabs, so keep your eye on them. They don’t take on much color and should spring back when you touch them with your finger. I've got more madeleine ideas up my sleeve, so stay tuned madeleine lovers! - Instant espresso powder can be found at Italian delicatessens, gourmet food shops, some grocery stores and online. I think MedagliaD’Oro is best because it has great flavor, is fine grained and doesn’t clump. I’ve also used Ferrara. You can store nstant espresso powder indefinitely. - I experimented with dipping these in chocolate. Nice idea but the dark chocolate proved to be too overwhelming and obscured the espresso flavor. 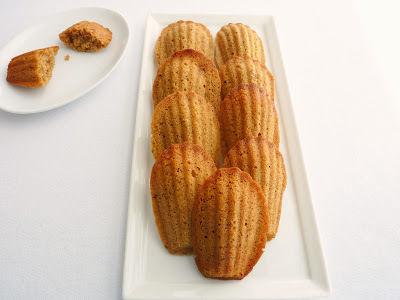 - For a fun seasonal madeleine, try Pumpkin Pecan Madeleines. Preheat oven to 375ºF. Generously butter one madeleine mold pan and eight wells in a second pan. Lightly dust with flour. Melt the butter, remove from the heat and set aside to cool. Sift together flour, baking powder, salt and cinnamon and set aside. a thick ribbon when the beaters are lifted, about 5 – 6 minutes. Lower the speed to medium and beat in the vanilla and espresso powder until blended. Using a large rubber spatula, fold the flour mixture into the beaten eggs in 3 equal additions. Then fold in the cooled melted butter in 3 equal additions until thoroughly blended. Fill the wells of the prepared madeleine pans. Bake until the cakes spring back when touched, about 10 –12 minutes. Remove from the oven and let them cool for 1 minute, then tilt the pans to dislodge them. Cool completely on a wire rack. Although no one can argue with the wonders of chocolate chip, oatmeal or peanut butter cookies, I’m always looking for new inspiration for the cookie jar. I’m starting to gather some ideas for the upcoming holiday season and that always includes scads of cookies. In addition to quintessential American cookies, I love exploring lots of other wonderful global cookie traditions. 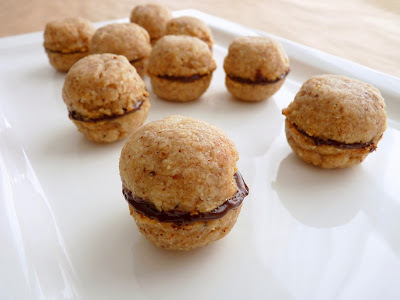 Baci di Dama is Italian for “lady kisses.” They are typically two small hazelnut cookies sandwiched with a kiss of chocolate. They come from the region of Piemonte where hazelnuts are gloriously plentiful. Originating in the late 19th century, Baci di Dama have been added to the official registry of Prodotti Agroalimentari Tradizionali, a list of traditional regional food products. Yes, they are that good! I use a mix of hazelnuts and almonds in my recipe. I also brown the butter to enhance the essential nuttiness. And since Italian cookies are traditionally not very sweet, I keep the sugar on the light side in order to emphasize all the other fabulous flavors. There’s also a nice pinch of salt to awaken your taste buds. These two-bite morsels deliver a great explosion of rich nut flavor and pure chocolate bliss. They are crisp on the outside with a great chewy texture on the inside. This is definitely my kind of cookie. Delizioso! - Toast the hazelnuts in single layer in a 350ºF oven for about 10 - 15 minutes, until they’re a golden brown color and the skins are cracked. Let them cool for a couple of minutes and then remove as much of the loose skins as possible. Cool completely. - Toast the almond slices in a single layer in a 350ºF oven for about 6 – 8 minutes. Watch them closely as they will burn very quickly. I use sliced almonds rather than whole ones because they grind with the flour to a finer crumb. - I like a slightly salty cookie so I use a heaping 1/4 teaspoon of salt. - A truffle scoop is the perfect tool to portion these cookies. Press down and pack the scoop with dough to prevent cracks. - The water in a bain marie for melting chocolate should be barely simmering. When chocolate gets too hot, it will seize and become grainy. - Store finished cookies in an airtight container. Cut the butter into small pieces and melt in a saucepan over medium-low heat. Swirl the butter carefully as the foam subsides and the butter begins to brown. The flecks on the bottom of pan will turn golden. The browning only takes about 3 – 4 minutes or so. Lift the pan off the heat periodically to check on the browning and to avoid burning. Pour immediately into a heatproof dish to stop the cooking. Set aside to cool. Place the flour, sugar, toasted hazelnuts and almonds and salt in the bowl of a food processor. Process until the nuts are finely ground. Add the cool browned butter, vanilla and water and pulse just until the mixture comes together into a crumbly dough. Pour into a bowl and compress the dough, if necessary. 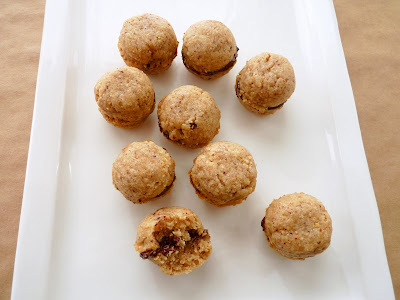 Portion the dough into 1” balls, packing tightly to eliminate cracks. A truffle scoop works perfectly for this task. Place on a baking sheet, wrap and chill until firm or overnight. Preheat oven to 325ºF. Line two baking sheets with parchment paper or silpats. Bake the cookies until light golden brown, about 14 minutes. Rotate the baking sheets halfway during the baking process to ensure even browning. Place the baking sheets on a wire rack to cool completely. Finely chop the chocolate and place in a dry heatproof bowl set over a pan with an inch or two of barely simmering water, making sure the bottom of the bowl does not touch the water. Stir the chocolate until smooth. Remove from the heat. Put a very small dollop of chocolate on the bottom of half the cookies. Sandwich with the remaining halves. Place them on their sides on the baking sheet until the chocolate has firmed up. The last vestiges of the fresh stone fruit season are plums. Among the most varied of fruit, there are over 2000 kinds of plums throughout the world, with about 100 varieties grown in the U.S. and 50 in northern California, which produces about 95% of the plums in this country. The season starts in May and goes through November. 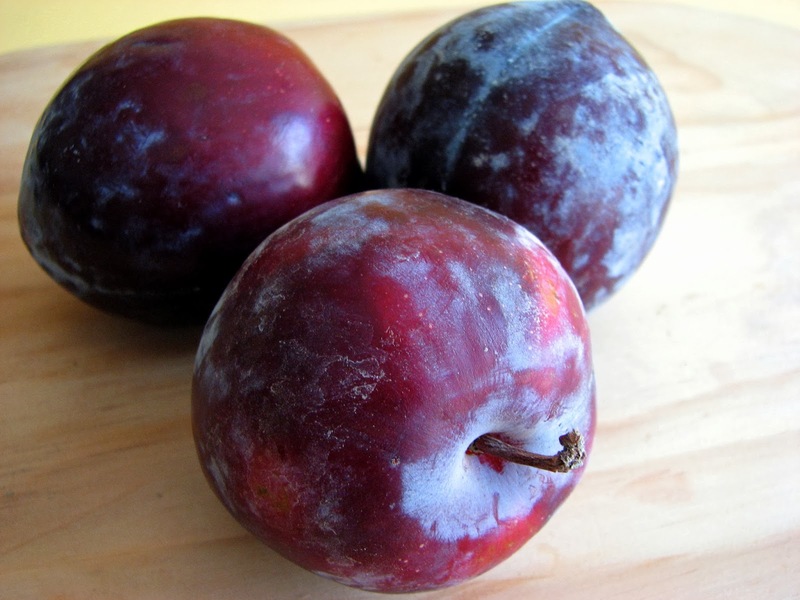 I’m seeing mostly plums with dark red-blue skins with pale yellow flesh where I live. Plums are a favorite for me in the kitchen because of their tartness and gorgeous color. For this ice cream, I roast the plums to concentrate their flavor and soften them enough to blend into a smooth puree. 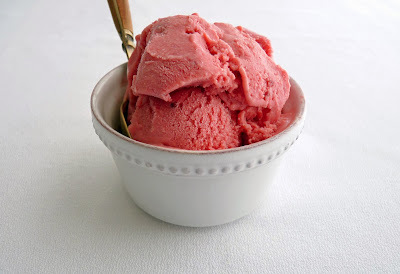 The result is an ice cream with a good dose of pure plum flavor along with a deep rosy color, a very enjoyable treat to savor before they slip away for another year. - Since homemade ice cream doesn’t contain any artificial ingredients or emulsifiers, let it sit at room temperature for a few minutes to soften before serving. - After pouring the finished ice cream into an airtight container, I press a piece of plastic wrap onto the surface and then seal with the lid to eliminate air pockets where ice crystals will form. 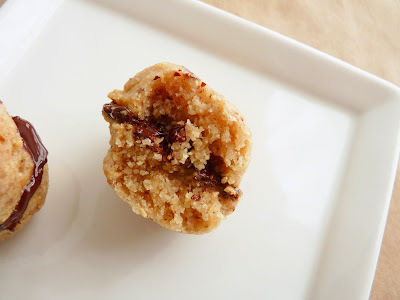 - For plum lovers, try Cinnamon Plum Cake and Plum Ginger Upside Down Cake. Cut the plums in half and remove the pit. Place them in a shallow dish cut side up and sprinkle with brown sugar. Roast until tender, about 15 – 20 minutes, turning them over halfway through. Place on a wire rack to cool. Puree the roasted plums in a food processor or blender until smooth. Add the remaining ingredients and blend, working in batches if the quantity is too large for your machine. Pour into a clean airtight container and whisk thoroughly. Add salt, to taste. Cover and chill thoroughly. 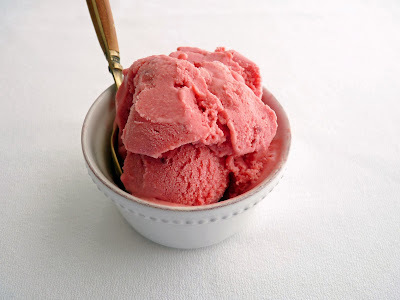 Freeze the ice cream base in an ice cream machine according to manufacturer’s instructions. Pour the ice cream into a clean airtight container. Press a piece of plastic wrap onto the surface, cover and place in the freezer to firm up. It’s a fall afternoon and what could be more alluring than the aroma of apples slowly simmering in your oven? Especially when they’re encased in flaky pastry. 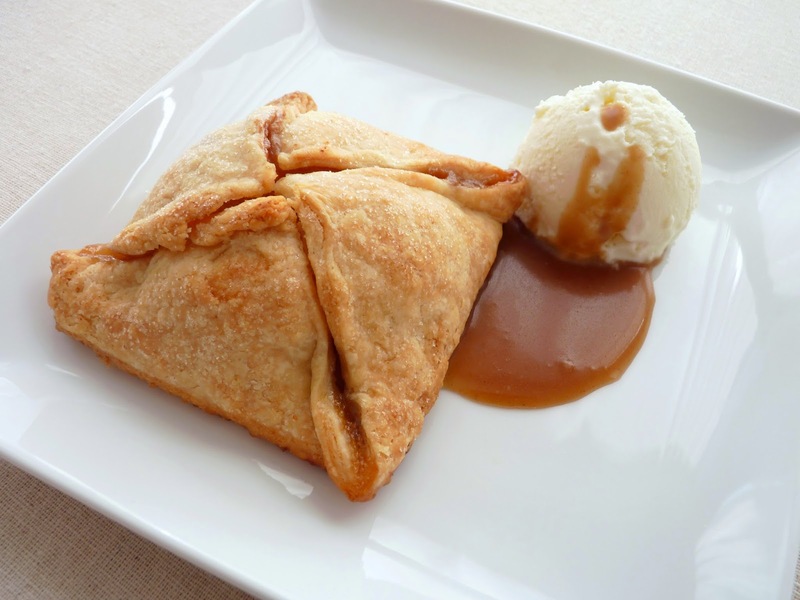 Like apple pie and turnovers, Apple Dumplings are another version of this kind of dessert sure to please flaky pastry lovers. I'm definitely an apple-a-day person but the fall season does give us a chance to emphasize all the incredible ways to celebrate apples. 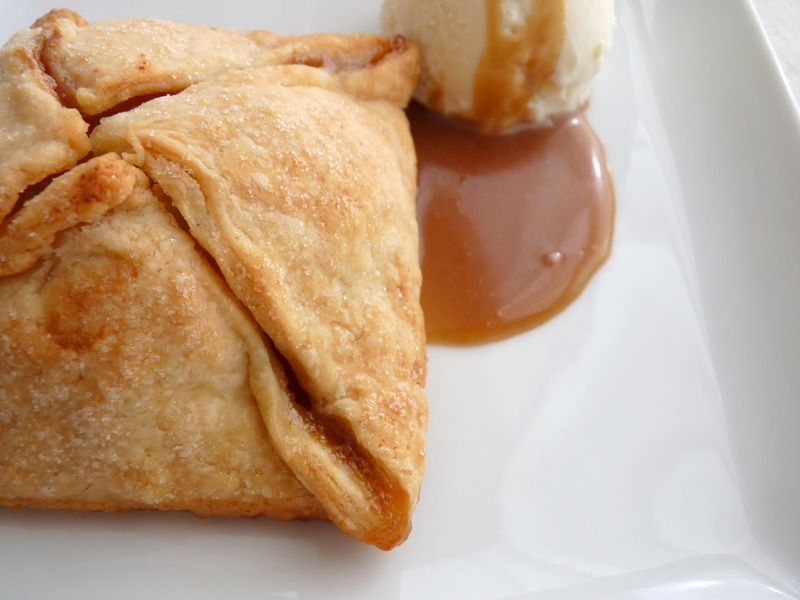 Apple Dumplings are sort of old-fashioned but certainly worth making in the here and now. 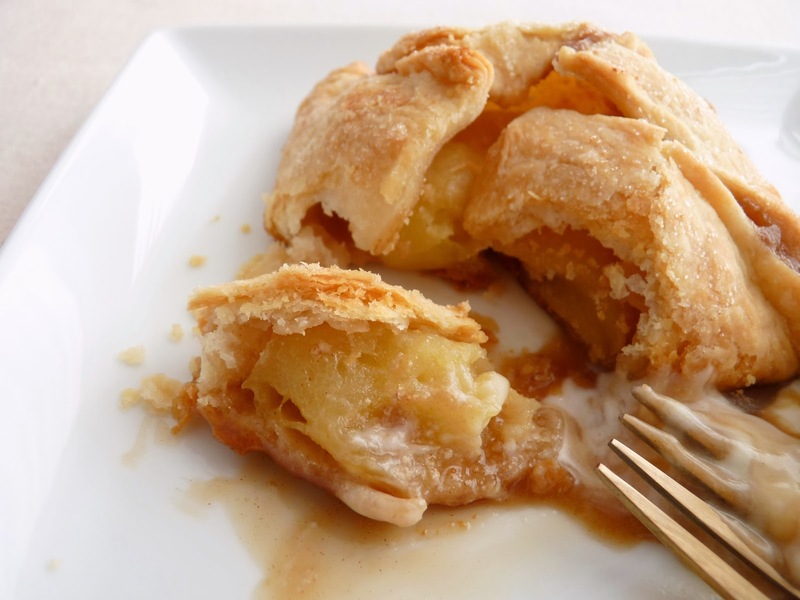 The idea likely originated in Britain and they were also a favorite in the early period of the American colonies, especially with the Pennsylvania Dutch who liked to bake simple pastries routinely and in good quantity. The scent of these pastries baking will drive you crazy. So have your plates, knives and forks at the ready to serve them as soon as they jump out of the oven. Seriously, what better way to greet the season? It’s not going to feel like it’s truly fall until you’ve added a dash of pleasure to your table. I say, revel in these intoxicating flavors and aromas as soon as you can! - The pastry dough can be made and stored in the refrigerator up to two days ahead. If it's kept much longer than that, it starts to turn a very unappealing grey. The sauce can also be made ahead and rewarmed. - Apples should be smallish medium in size. I used Fujis. Granny Smiths are also great. - If the rolled-out sheet of dough gets too soft, chill it while you prepare the fruit. - Add a splash of brandy or rum to the sauce for some seasonal warmth. - These are best served warm straight from the oven with sauce and vanilla ice cream or a dollop of crème fraiche. - Lots of apple recipes in my Recipe Index. And I love the Apple Cinnamon Cake from The Global Pastry Table. For the pastry dough, place the flour, sugar and salt in the bowl of a food processor and process to combine. Cut the cold butter into 1/2” pieces, add to the flour mixture and process until it looks like coarse meal. Add the water and pulse about 15 times. The dough will look like lumpy like cottage cheese rather than a smooth dough. Gather the dough and place on a piece of plastic wrap. Shape into a flattened disc and wrap. Chill at least 30 minutes or overnight. Combine sour cream, brown sugar, lemon juice, vanilla and a pinch of cinnamon. Chill. Remove the pastry dough from the refrigerator and rest on a lightly floured work surface for a few minutes so it can soften just a bit to prevent cracking. Roll the dough out to a 12" square, gently lifting and moving it after each roll and keeping it lightly floured as needed. When you have the desired size, brush off any excess flour. Trim the edges and cut into four 6” x 6” squares. Peel the apples, cut in half and core. Fill the cavity of each half with the sour cream mixture. 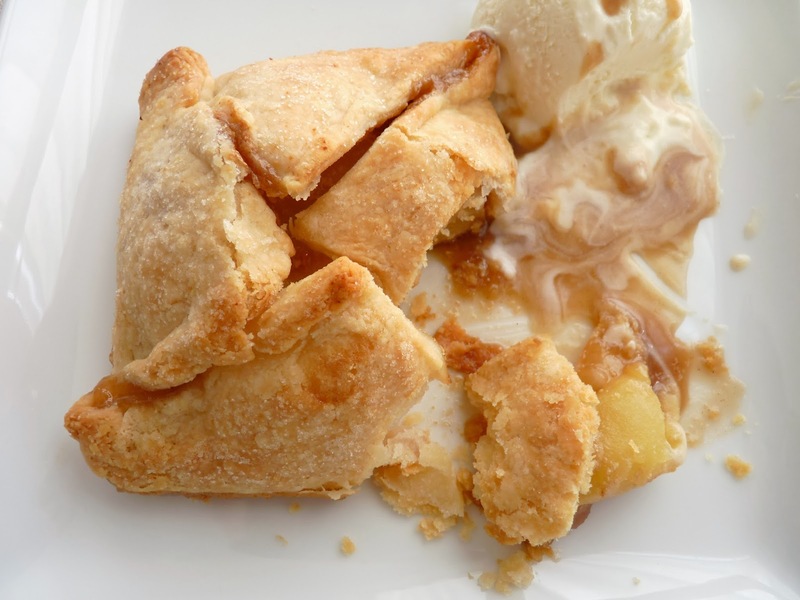 Sprinkle each filled apple with 1/2 teaspoon of brown sugar. Center a pastry square on top and invert so the rounded side of the apple is facing up. Sprinkle each apple again with 1/2 teaspoon brown sugar. Gather each corner of the pastry to the center and pinch the seams and corners to seal. Place on the prepared baking sheet. Brush each dumpling with melted butter and sprinkle lightly with granulated sugar. Bake until the pastry is golden brown and the juices are bubbling, about 35 minutes. While the dumplings are baking, prepare the sauce. Place the brown sugar, butter, water and a pinch of cinnamon in a saucepan over medium low heat. Bring it to a slow boil for just a minute, whisking constantly. Take off the heat and add vanilla and a pinch salt, to taste. Plate the dumplings with a dollop of sauce and a scoop of vanilla ice cream. Serve immediately.